Figure below shows the functional blocks of A/D and D/A converters. 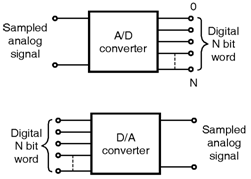 The A/D converter accepts an analog sample and produces an N bit digital word, where as D/A converter accepts N bit digital word and produces an analog sample. The output of D/A converter is fed to the S/H circuit and staircase waveform is obtained this staircase waveform is further given to low pass filter which produces smooth analog signal.